Can a private Royal Mail deliver? Image caption What does the future hold for a privatised Royal Mail? After years of debate and controversy, the Royal Mail's privatisation has been announced. Some shares will go to staff, and the public will be able to buy some too. Unions are unhappy, while proponents argue it is long overdue. So what does the future hold for the 500-year old postal delivery service? In the past five years the volume of letters being delivered has declined 25%, and is expected to keep falling by 7-8% per year. Stephen Gibson used to be chief economist at Postcomm, the old industry regulator. Now at SLG Economics, he says the market has transformed over the post-war period. "For decades after World War II, economic activity and letter volumes increased roughly in line. As GDP grew, so did the number of letters sent," he says. "Now, work inbox trays in offices lie empty, while email servers carry the bulk of daily messages." Online shopping is still growing at a robust pace, and that is where delivery companies are making money. Ian Senior, a postal economist, says that a privatised Royal Mail will face competition, and will have to prove itself in the parcel market to remain profitable. "Parcels are a competitive market - and the Royal Mail has no monopoly over parcels, as it does over letters," he points out. Mr Senior says other countries' privatisations have worked well. "In the Netherlands, with TNT, and Deutsche Post in Germany, these services have become very profitable, and very successful. "They had light-touch regulation, were privatised, and have been able to sustain a profit." He argues that there is no reason why that model should not work here. But, not everyone agrees. Royal Mail as it stands, led by Moya Greene, is currently making a profit. Operating profits for the 52 weeks to the end of March this year jumped to £403m, up from £152m for 2012. The company has already undergone massive restructuring over the past few years, and the bulk of the assets and liabilities of its pension fund, which had at one point an £8.4bn deficit, were taken on by the government to relieve the business of making huge payments. That paved the way for profitability, and ultimately, for privatisation. At the time of the results, business secretary Vince Cable told the BBC it was essential for future investment that the company was privatised. "In practice we have to bring private capital in," he said. Royal Mail is now estimated to be worth £3bn. Lindsay Mackie, formerly of the New Economics Foundation and a campaigner on the postal service believes Royal Mail should stay in the public sector. "It's a business in profit. It's well run. Yes, letters are dying but it's proved itself flexible and responsive to change," she says. "We have a really brilliant postal service, and there is no comparison that shows a privatised system is doing better. The European examples are not good. Services have deteriorated. The key thing is that it's an efficiently run company - and despite what many say about the unionised workforce, there's not been a strike for decades." 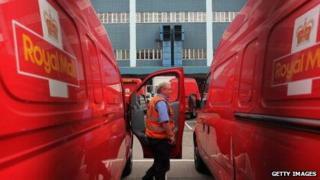 The CWU union is now balloting its 125,000 Royal Mail members on national strike action. A strike over pay, pensions, and fears over future post-privatisation problems could be on the way as soon as 10 October. Fears over working conditions have been emphasised by the experience of the TNT workforce in the Netherlands pre and post-sale. "The situation in the Netherlands has been bad in terms of wages and conditions. It has deteriorated," Ms Mackie says. SLG's Stephen Gibson agrees that ongoing industrial relations issues would be problematic for a future, privatised Royal Mail, something that could cause investors to pause for thought. "If there were strikes all the time, and service disruption, that would be a problem," he says. One thing all agree on is that the future of Royal Mail, and the six-day-week home delivery service, is an emotive topic. Mr Gibson says: "There is something about a universal service. But does it need to be six days a week? If people want that, should they be paying more? It's an expensive social service." Mr Senior says that progress must take precedence over nostalgia: "I sometimes say to people, 'when did you last see anyone under the age of 30 sending a letter or going to the Post Office to buy stamps?' The answer usually tells you what you need to know." But Ms Mackie disagrees: "It's not just another company. It's a public service - and as such is different." Does private ownership always beat public?